General Contractor: Trice & Harris and J. W. Mann & Bro. Constructed 1901-1902, the McLennan County Courthouse was designed by J. Riely Gordon. The building was erected by Tom Lovell, contractor, and construction was supervised by W.C. Dodson, architect. 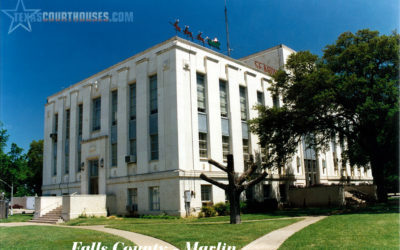 Built during prosperous times, it is the fourth courthouse in the county’s history. 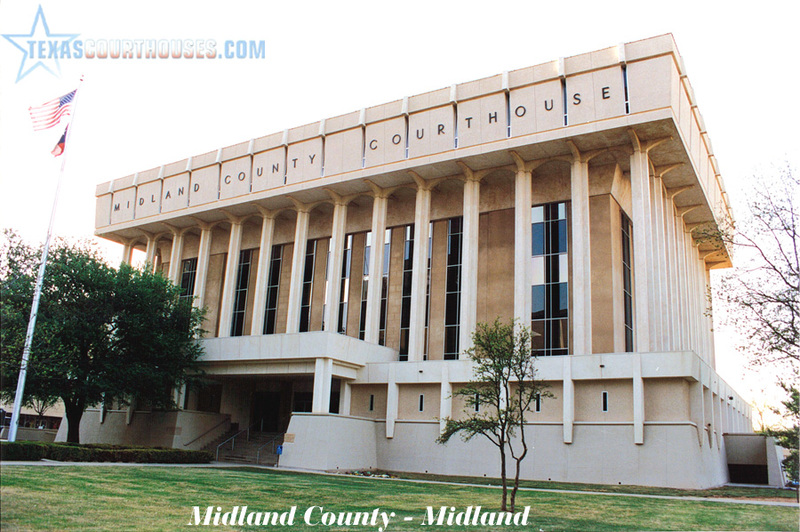 The courthouse is on a cruciform plan with corridors extending lengthwise through each arm. On the upper two levels, several courtrooms are located at ends of the cross. A rotunda extends up through the crossing. The exterior is distinguished by Beaux Arts Classical style on a monumental scale. The concept of composition of the building with its wings, dome and dominant entrance is similar to that employed in the Texas Capitol. Numerous features contribute to the success of the Beaux Arts style in this building. A colonnade with paired end columns announce the main entrance; above the entablature supported by these is a wall with decorated pilasters, surmounted by triangular pediment and bull’s eye window. This compositional theme was duplicated in the pavilions on the long wings; however, in these a balcony is introduced and the paired columns are brought forward, thus breaking the plane of the facade. The Corinthian order was used for the columns, while Doric was employed on the pilasters. The monumentality of the edifice is further dramatized by the lengthy stair. In the entrance portico, the door opening is emphasized by a segmental pediment, and windows are surmounted by triangular pediments. The building is essentially a three-part composition; the base encompasses the first story; two stories, extending between a water table and entablature, are contained in the middle section; and one story is included in the terminal feature. Two entablatures, the upper one of which is topped by a balustrade, encircle the top level. The dome unifies the entire composition. In typical Beaux Arts style, paired columns around the drum support an entablature above which rises the dome. Roman-arched openings flanked by pilasters in Corinthian order are contained between the paired columns. Surmounting the lantern of the dome is a statue of Themis, the Greek personification of justice. Below are two smaller statues, one of a torchbearer, the other of Justitia, the Roman version of Themis. Roman eagles surround the dome. Urns appear above the ends of the secondary pediments. The exterior walls incorporate beautiful materials. Quarry-faced granite was employed for the base; above this cut limestone with rusticated joints was used. Marble was used for accent at various locations. For the structure, steel and concrete were used. The courthouse has architectural and historical significance. It is one of the finest Neo-Classical buildings in the state. Historically it has served county government for over three-quarters of a century. 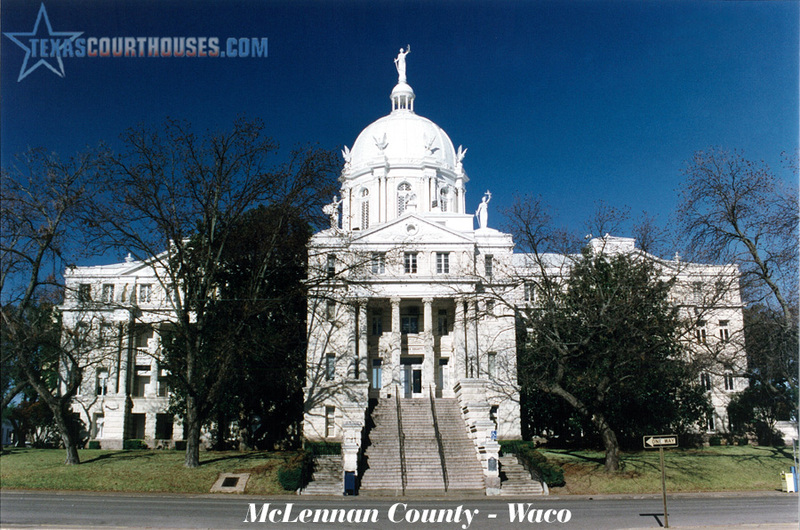 McLennan County was created in 1850. Earlier in the century the area had been occupied by the Waco Indians, who established village on the present site of the city of Waco. Some settlement occurred during the 1830s and 1840s, and by 1860 the county population exceeded 6,000. In 1849 Waco was surveyed, and in 1850 a commission voted to locate the county seat there. Education has been an important aspect of the culture of Waco. At one time Texas Christian University was located in the city. Waco University also was founded there; in 1886 it was united with Baylor University when the latter was moved to the city. The first courthouse was built-in 1850. It was thirty feet square, one and a half stories high and cost $400. In 1858-1859 a larger courthouse was constructed for about $11,500. Robert H. Smith was the contractor for the edifice which was built of bricks and had a tin roof. In 1876 a third courthouse was built according to the plans of W.C. Dodson, a local architect. This was completed the following year for about $30,000. Finally in 1900, county commissioners submitted a $250,000 bond proposal to the electors. This was passed and plans and specifications were invited for a courthouse to be located on a new site. Upon the recommendation of W.C. Dodson, the plans of J. Riely Gordon, of San Antonio, were adopted. The contract was awarded to Tom Lovell of Denton, Texas. On November 3, 1902, the new temple of justice was accepted. The pride of the people in their accomplishment is commemorated on the granite cornerstone where the inscription, “built by the taxpayers of McLennan County” appears. It still serves county government.